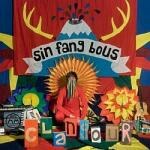 Clangour may not be perfect, but it positively brims with perfect, unabashedly psychedelic moments. The songs, that is to say, speak for themselves. For a moment on “Fafafa” -- arguably the record’s finest track -- the singer's stifled mumbles and grating electronic groans suddenly give way. Then, a gorgeous barrage of multi-layered vocals with a pop chord progression, brightly and confidently strum. Then, glimmering organ, piano, echoes of backing vocals and percussion get added. It all sounds so natural -- such a grand transition -- kind of emblematic of Sigfússon’s songwriting. Despite the cluttered layers of distance between song and production -- bloops and bleeps, buzzing lo-fi chaos, other elements of distance and distraction -- the melodies and harmonies seem always to shine through. To hear Clangour is to immerse oneself in a rich collision of genres that all seem to build momentum within a psychedelic context. Folktronica is a pretty silly term -- I can barely utter it aloud with a straight face -- yet it defines much of the album. "Clangour and Flutes", a particular example, marches with its driving techno beat a surreal backdrop for the singer's hushed, Iron & Wine-style songcraft. The track's sonic landscape, however, is a dense grab-bag of Nigel Godrich trademarks: dreamlike piano arpeggios, rattling electronic percussion, even a jarring flute solo. Elsewhere the artist lets his electro-pop fancy run wild on "Catch the Light", a pulsing, mid-tempo number and "Advent In Ives Garden", a hyperactive workout with an intro like a '95 Zelda soundtrack. He tackles the folk side of the spectrum on "Poi Rot", with its acoustic pop and fey vocals hushed enough to pass for a Sufjan outtake. More wonderful, however, are the flirtations with `60s psychedelia, and "Sunken Ship" is the mini-masterpiece. About two minutes in comes another utterly transformative moment, in which tinny drums and processed synthesizers dissolve into a blissful explosion of flutes, xylophone and guitar. The conclusion is a colorful dancehall piano solo, total Sgt. Peppers homage and perhaps the album's most organic and alive refrain. Like Dungen's music, it's unabashedly retro, yet never self-consciously so. What's fantastic -- and what ultimately makes the record a triumph -- is how deftly Sigfússon treads the line between producer and songwriter; how fluidly the songs (generally quite accessible) and sounds (as otherworldly as anything this side of Merriweather Post Pavilion) mesh together. It's not perfect ("Melt Down The Knives" tries on a stripped-down garage rock grittiness that never quite fits; "We Belong" is one techno/folk-pop marriage too many, like "Clangour and Flutes" to blander effect), but it proves a dazzling tour-de-force in both stylistic and sonic terms. The result of this restless tinkering resembles more an endless stream of brilliant musical moments and ideas than a cohesive whole, but with an artist as inventive as Sigfússon behind the wheel, it's difficult to complain.